“If you want to he attentive to your soul, you simply must find ways to honor your need to acquire a sense of rhythm in your life-some kind of balance in your work, leisure, and prayer.” (Weiderkehr)How can ordinary people practice a rhythm of pausing and noticing, noticing the work and presence of God in their world? Why are the Divine Hours a helpful rhythm of prayer?A few years ago I discovered the Divine Hours – those ancient rhythms of prayer that purposefully take one through the day with the Lord, pausing in the middle of the day for small conversation. I’ve discovered wonderful prayerbooks that guide through the hours, but it wasn’t until I came across a Benedictine Short Breviary that I had seen a prayerbook that really guided through all seven hours (see below).I quickly purchased that Breviary and excitedly kept company with the Lord on the seven hours, with some routine, but a lot of struggle to keep the rhythm. Carrying that little book with me everywhere as well as trying to pause in the middle of the day was a tough discipline to establish. I enjoyed, however, the significance of the pauses in the day; each pause and time of prayer had a certain something to add to that time of day, even projecting and connecting times of life to times of the day.To illustrate what I enjoyed, this comes from Weiderkehr’s book: “We practice pausing to remember the sacredness of our names, who we are, and what we plan on doing with the incredible gift of our lives-and how we can learn to be in the midst of so much doing. We have to practice loving and forgiving. We practice breathing and being careful with one another’s life. We practice nonviolence. We practice enjoying what we have rather than storing up possessions. We practice silence.”After loosely keeping company with the Divine Hours (6, 9, 12, 3, 6, 9, with sometime in the middle of the night for an enthusiast – which I wasn’t) and the breviary, I needed to pause. What I wanted to discover was a rhythm that I could share with my family, Jenny and my two boys who are 3 and 1. I wanted to practice rhythms of prayer so that I could walk with them in prayer as well, once the boys discover the beauty of sitting still (this might be a while…).So, the Benedictine Breviary, though so richly beautiful, was too much to engage for where my family is at and will be for a while. But, I wanted to retain the beauty of the hours, the significant pauses of the hours.That’s when I discovered Seven Sacred Pauses (through seeing it mentioned in Phileena Heuertz’s A Pilgrimage of a Soul).I read with thirst.What I’ll share with you now comes from the book; these clips are helpful phrases regarding the intent of each hour. I find them helpful and hope to memorize them in order to continue to keep company with God, pausing in the various special times of a day.1.) Matins or Vigils. “The Night Watch” (Sometime between midnight and dawn). Themes for the hour: vigilance and deep listening mystery and silence surrender and trust.2.) Lauds or Morning Prayer. “The Awakening Hour” (apx. 6am). Themes for the hour: praise and resurrection joy and delight the coming of the light.3.) Terce or the Third Hour of the Day. “The Blessing Hour” (apx. 9am). Themes for the hour: the coming of the Spirit wind and flame, breath and blessing strength and courage the sacredness of work.4.) Sext or the Sixth Hour. “The Hour of Illumination” (apx. noon). Themes for the hour: commitment and passion courage and faithfulness healing, truth, and peace.5.) None or the Ninth Hour. “The Wisdom Hour” (apx. 3pm). Themes for the hour: steadfastness, surrender forgiveness and wisdom impermanence, aging, maturing death and transition.6.) Vespers or Evensong. “The Twilight Hour” (apx. 6pm). Themes for the hour: gratitude, praise serenity, mystery the lighting of the lamps.7.) Compline or Night Prayer. “The Great Silence” (apx. 9pm). Themes for the hour: silence, rest, and sleep darkness, trust, and protection personal sorrow, completion, intimacy.…I recommend Weiderkehr’s book to those who would like to hear more about the hours. There are helpful guides for prayer tucked into the back of each chapter as well. I found her book a good, concise guide to the hours, to taking the soul of the hours into my life, pausing with the above thoughts in mind to inspire simple prayer. This book did a great job of over-viewing the practice of pausing throughout the day in prayer and meditation. Gentle, well-crafted chapters. Why three stars and not five? Seven Sacred Pauses included many prayers and meditations that were not exclusively Christian, and that leaves me to seek them in other places. This book is worth a read- especially to understand the practice of "living mindfully throughout the day." I like to think that when I wake in the middle of the night it is such a good time to pray and reflect on the healing power of night...and it helps me return to sleep. I will be reading most of this book every day as I am attempting to pray mindfully throughout the day. I love the new perspective on each phase of the day, especially the part about work being our love made visible. I have been challenged, humbled and blessed thus far by the prayers and insights in this little book. This small devotional book reminds us to live thoughtfully through the day. I’ve enjoyed the poems, quotes, and hymn texts. I’ve tried reading small portions of this inspirational text during the work day and found that it helps me maintain a focus on what is most significant in work rather than being caught up in busyness. A beautiful book to guide us in the art of divine pauses, also known as the daily office. An invitation to beauty. I've been interested in learning and practicing mindfulness. The book is beautiful, maybe a step on the mystical side, easily applicable to even a more conservative believer if you choose the scriptures you'd prefer to mediate on. I'm inspired but not sure I'm dedicated enough! An easy and lovely read. Author Joyce Rupp recommended this book at one of her workshops. Seven Sacred Pauses is full of wisdom. I expect to reference it many times in the years to come. I like the idea of pausing and being more mindful. But, this book ended up being overwhelming for me. With seven times of day, each with 5-8 themes, I just found myself asking "What pause are we doing? What am I supposed to be focusing on?" I was disoriented.I know the author intends for the book to provide options, but for a newbie it was too much to choose from. Each pause has themes, prayers, psalms, chants, antiphons. I needed something more simple. I was ready for...at this time of the day focus on x and do y. Not for... At this time of the day focus on a, b, c, d, e, f and do v, w, x, y, z.I think the book would be a nice source of inspiration for those who already have a working knowledge of the seven pauses and are looking to add variety to their committed practice. I just needed a beginner's version. I was already pre-prejudiced before reading this book...I've heard Macrina give retreats and speechs in Kansas City, and she is a nun from St. Scholastica Monastery in Ft. Smith, AR, where I attended high school. The subject matter was one I've been intrigued about: the rule of St. Benedict encouraged stopping 7 times a day to pray. In my 15 years of Benedictine education, I had been curious, and then very drawn to, the 7 pauses I saw many of my teachers embrace. When I witnessed Vespers and Matins at Subiaco Monastery, I was hooked. I won't be getting up at dawn, but the book has inspired me to slow down, be more prayerful, and has given me some wonderful tools and readings to inch me ever closer to my Benedictine roots! I'm sure I haven't read all of the antiphons and quotes in each chapter in this book, but I'll continue to revisit and use this as a prayer resource in the future. I'm not a great pray-er, so I really enjoyed the idea of structuring prayer throughout the day based on age-old themes: morning, vespers, night watch, and more. Additionally, I'm the farthest thing from a mystic possible, but I think a small dose of mysticism in my prayer life is probably a good thing. I enjoyed some of the gathered quotes and thoughts that led me in that direction. This book was full of insight on how to "pause" from the everyday and be mindful of our hours. I like the format of the book as it provides various suggestions for prayers and readings for each of the hours. I also happened to purchase the companion mp3 album by Velma Frye for use with the book. I did take one star of for the overly mystical phrasing that got in my way at times. Still, highly recommended, especially for lay people who would like to experience the sacred in their day. This book is subtitled "Living Mindfully Through the Hours of the Day" and is intended as a meditational reading. While actually observing the seven hours of prayer in a 24 hour period is not practical for most people who live outside a monastery or cloister, the material in the book is good meditational material and can be used in many ways. Macrina Wiederkehr is a Benedictine and is one of my favorite authors of spiritual guidance material. Just spent a week on retreat using this book to guide my pausing to pray the liturgy if the hours during the day, and now that I am back in real life I have great hope that this practice will help me to stay connected to God despite the stress and pressure of a full- time job, three young kids and a husband taking classes. I liked this book. It felt very peaceful. It felt like I needed to buy a copy and just live on each page for a week or so. I read it because Jen Hatmaker mentioned it in her book 7, and she said she just wanted to quote the whole thing. Now that I've read it, I understand why. I don't know if I'm going to try to pray the hours, but I did enjoy reading and how to do it. I liked the concept of stopping for prayer during the day. I am trying to put this into practice with bell alarms on my cell phone. However, a great deal of this book is self-focused. In my seven sacred pauses I would rather turn my eyes to Jesus the author and finisher of my salvation and contemplate His grace than focus on myself. A wonderful resource for persons interested in praying the hours or simply looking for a way to add moments of contemplation to their day as it progresses. 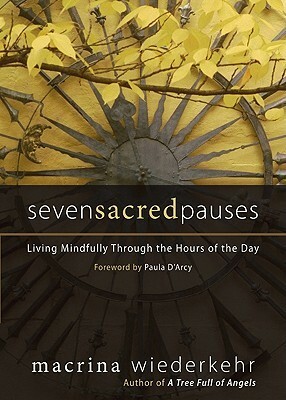 Wiederkehr does a wonderful job of reflecting on each of the hours, what she calls "sacred pauses" and gives examples of how one might honor them, even with a very busy lifestyle. Highly recommended. This is a gem of a prayer, and contmplative book. Like the monks' practice of the Daily, this gives all of us a guide and text to use in dividing and divining our day into 7 parts set aside to rememeber God and who and what we are -- or ought to be as Christians. If you ever envied the Moslems' daily call to prayer, here is your Chrisitan alternitive. I was slightly disappointed - but overall, the book was ok. I guess I expected more of a guide/personal reflection as to how the author sought to live the Liturgy of the Hours. Instead, it was more like a 're-write' of them. It's a good devotional, but not what I was looking for when I picked up the book. I have finished this book today and just added it so I really didn't read it in one day. I have always wondered about a life spent praying the hours and this has certainly added much to think about. It explains why one would pray at each designated time and offers suggestions for prayers and readings. A nice book for thinking about praying through the day. I didn't resonate with the "contemporary psalms" or some of the prayers, written by the author, but that's just me. I think I liked the idea of this book better than what it ended up being, although it might be a very good book for those who don't feel as connected or sustained by traditional church worship or words. This is not a book one reads and then sets aside. It has become part of my daily quiet time and more. Although I have been unsuccessful at pausing seven times daily, I do pause more now than ever. This directs my prayer mindfully and purposefully. I appreciate the guidance and the variety of prayer and reflection options. Very meaningful, relevant, and spiritual. I read this at the recommendation of a friend. It both sets the pace for moments of prayer during the day as well as a calmly influence in times where patience and quiet are needed.With the help of this book you can take a mini retreat whenever you are moved to do so.Highly recommended. As a non-litergical Christian, I found this book to be full of surprises and good take aways. Although i did not resonate with a lot of the content, I began to think about how my own prayer life can change. Recommended read. This came highly recommended by a number of colleagues in ministry. I appreciated the framework -- and will seek to use it as I try to reclaim and restructure my prayer life but the prayers themselves were a bit too wordy for my own need for silence and sacred space. This one will probably stay on my current reading list for awhile. It's a book to be digested over a period of time - Read through the top-level of each chapter first and then return over and over to the readings and meditations for a particular "pause" of the day. I loved this book. I am such a fan of the rhythm of the Divine Hours, and I am working to incorporate them into my life. Beautiful descriptions of the focus of each of the times of praying, lovely meditations. Macrina Wiederkehr - Macrina Wiederkehr is an author and spiritual guide and a Benedictine monastic of St. a Monastery in Fort Smith, Arkansas. She travels throughout the US and Canada as a retreat director. In her retreats seekers are guided through experiences of silence, contemplation, and faith sharing.